Email has developed into a mature marketing vehicle and is holding strong as the best performing channel for most in the mid-market. The data suggests, however, that opportunities exist to better leverage proven tactics to drive increased return on investment, and that the investments made in people, process, and technology to build a connected marketing organization can drive a significant lift in campaign revenue and bear fruit in the near-term. Marketers have their priorities aligned appropriately, now is the time to marshal the resources, dig in, and work towards the common goal of integrating programs and delighting consumers. 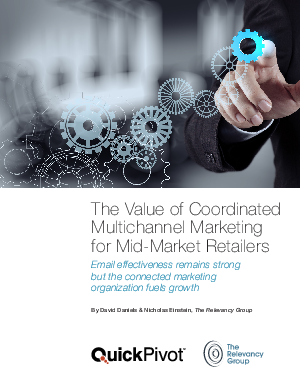 The Relevancy Group believes that mid-market organizations who adopt and implement our Connected Marketing Framework will be well positioned to capitalize on the significant opportunities that true coordination presents.